Do you need something else than a traditional turkey? Try this whole roast chicken! Perfect for a couple or a dinner for two at home! The delicate flavors of the spices with the whole chicken make this a one of a kind dish that is just right for a special occasion like thanks giving. This dish calls for a very pretty presentation! Although it is slightly labor-intensive, the outcome and the visual appeal of this dish, more than make up for the difficulty of its preparation. I used to make this for festive family gatherings sometimes wrapped the whole chicken in banana leaf. This is also best served when you want to impress and surprise someone! Serve this with a side of roasted potatoes, veggies and a bow of steamed rice. 3 to 4 tender banana leaves optional. 1. Rub the lemon juice and salt all over the chicken very well. 2. Heat the oil in a heavy-bottomed frying pan over medium heat, add the onions and cook until the they start to brown. Add the ginger, garlic, and green chili peppers and cook for 2 minutes, or until soft. Add the almonds, paprika, turmeric, and garam masala. Cook, stirring frequently, for an additional minute. Remove from the heat and allow the onion mixture to cool completely. 3. Place the cooled mixture in a food processor along with the chopped fresh coriander, and grind to a smooth paste. Rub the paste thoroughly all over the chicken and inside the cavity. Tie the legs of the chicken together to keep them in place. Cover and refrigerate for 6 to 8 hours. 4. Preheat the oven to 350°F (175°C). 6. 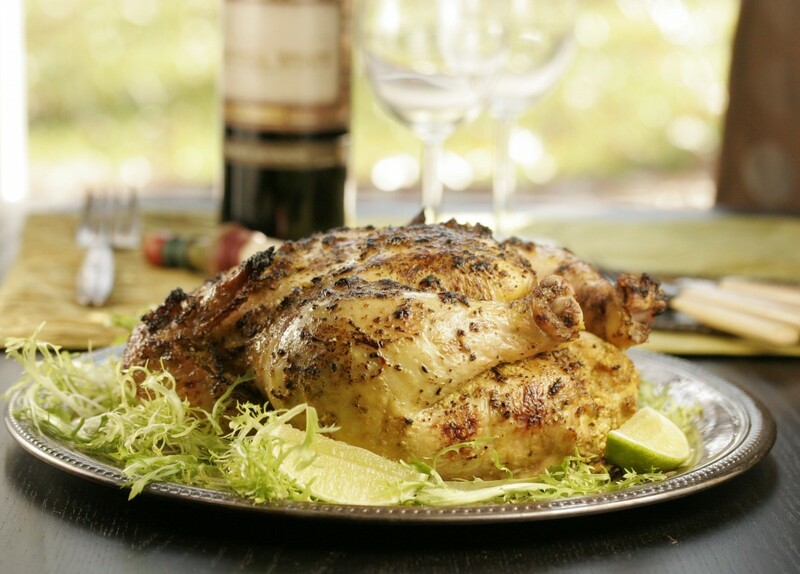 Place the chicken in a roasting pan and bake for 45 – 50 minutes, until the chicken is cooked and tender. Make sure half way thru the baking, turn around the pan even cooking. 7. Baste the chicken with some of the pan juices and return it to the oven for 10 minutes or until brown and the skin roasts well. 8. Place the chicken on a serving platter. Serve hot, and carve table side.